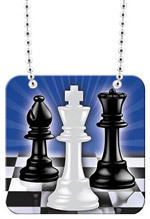 Aluminum chess "dog tags" / "bag tags" feature cool color chess artwork, and have a high-gloss protective covering. Big "mega chess tags" are 2 inches square, and have a free ball-chain! The long chain part is the "little metal ball" style, that you could hook into a keychain type of clasp -- so it would be easy to cut the chain much shorter for use as a chess tag on chess bags, backpacks, etc. As such: These can be used as a cool neck chain or large "dog tag"; or they can be converted to a nice chess bag tag!